Last Friday, the Chinese version of well-known South Korean reality show Running Man returned to TV screens for its fourth season. The first episode took place at the relic-filled Hangzhou Museum, a choice which triggered heated debate online after the episode was broadcast. 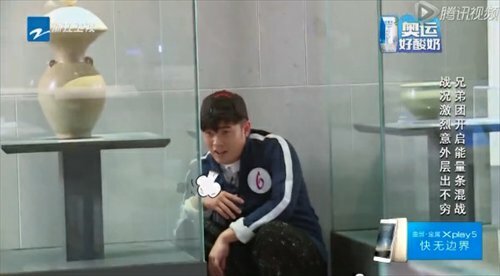 Arguing that the variety show had endangered these historic, and in some cases fragile, relics in danger, the hashtag "Anti-Running Man in museum" made Sina Weibo a central platform for criticism from Chinese netizens. Soon after mainstream media outlets followed step. The reality show is famous for race missions that require the main cast to sprint after each other in attempts to remove competitors name cards off their backs. People familiar with the show know how chaotic this competition can get as it sometimes leads to physical brawls and lots of yelling as competitors clash and the camera crew buzzes around looking for a good shot. Overall, criticism so far has mainly focused on two points. The first point was concern that the playfulness on display showed a lack of respect for these national treasures. A Beijing-based Guangming Daily editorial commented that while shooting at a museum may help advertise these relics, the way the crew went about it violated the atmosphere that a museum should have. "All museums should be quiet, not only out of respect for the enjoyment of others, but also to show respect to our ancestors and their civilization," it said. In Western countries, it is common to see some activities being held at museums, but "even if there are some activities, they are held in open areas instead of display areas," a report by Beijing Daily wrote. The other point of criticism related to worries that the strong stage lighting used during shooting may have damaged these ancient relics. "For preservation, museums maintain strict control of light levels. The light used to shoot a reality show could cause irreparable damage to relics," the Beijing Daily report said. "Some relics made of special materials, such as paintings and calligraphy works, are easily corrupted and damaged by flashlights," an expert working for the Nanjing Museum told the Yangtze Evening Post. "Domestic public museums use special glass for cabinets that is very difficult to break, but it is not appropriate to be playing around relics," he added. This incident has many recalling how the South Korean version of Running Man shot an episode at the National Museum of Contemporary Art in 2010. At the time, host Yoo Jae-suk emphasized that everyone should run as quietly as possible so as not to disturb the artworks. Meanwhile, the name tag competition took place in a multimedia showcase where there were no relics. The Hangzhou Museum has yet to issue a statement about the controversy.